In the Category menu mark the item License administration -> Clients. Select the Licenses index page. Select a license product top right. -> Now detailed license information is displayed under License key and Host ID/Role. Check, whether all received licenses are listed. Click on the Add file button. 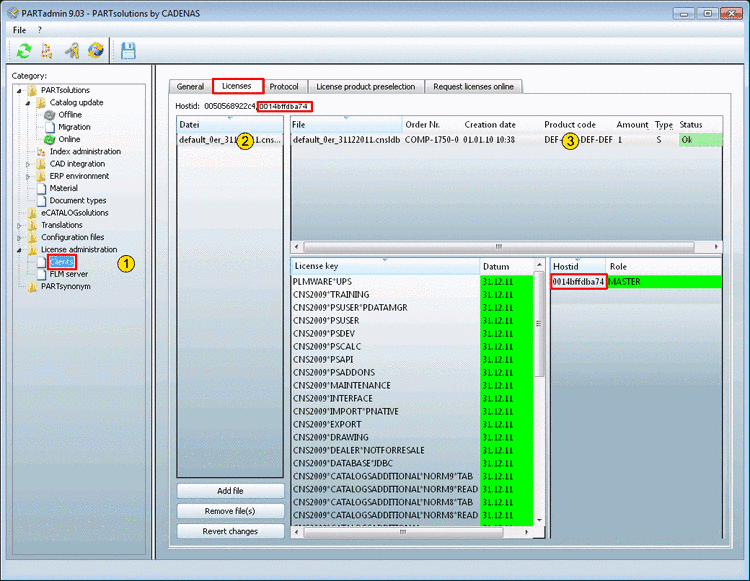 -> An explorer window opens, where you can select further license files (*.cnsldb). Search the storage location of the file. --> Now the file is listed in the license administration. Remove file(s): ... deletes the marked file(s). Thereby not only the entry in the license administration is removed, but also the respective *.cnsldb file in the lic / keysdirectory of your PARTsolutions installation. In case of need you can rebuild the file from the backup file *.bak. Simply rename the license file to *.cnsldb again. Mark the License file in the dialog area top right. --> The individual License keys with Expiration date and Status are listed. Check, whether the Host ID of the license (downright) is according to one of the Host ID displayed above (see Fig. „Licenses“). In order for the license to be effective for the respective module (PARTdataManager, etc. ), the Status has to be OK (green). If this is the case, then the licensing was successful. Indeed the license is still valid, however you should take care to get a following license in time. In order to finish the procedure, click on the Save changes button! (If not already happened during the license installation). --> Now PARTsolutions is enabled. After double-click on a license file / license product (*.cnsldb) the Software information dialog box appears. 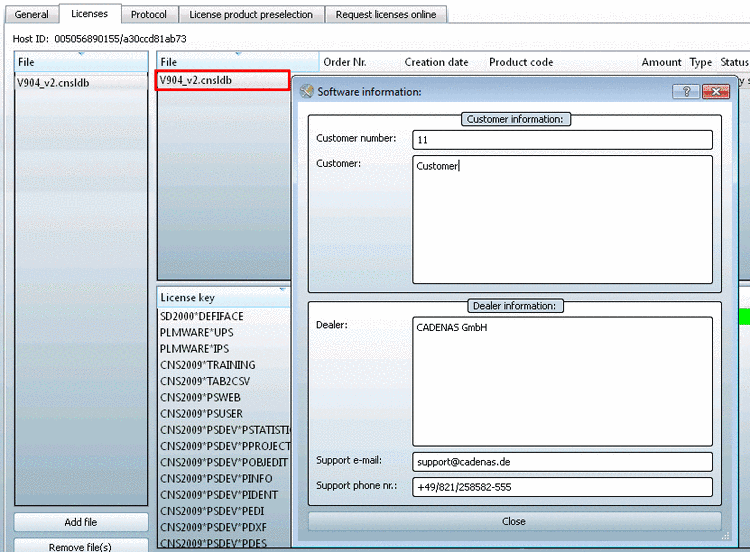 In the Customer information dialog area you can find your Customer number. Stating the number helps the support better help you. Under Dealer information you can find the relevant dealer with Support e-mail and support phone number. 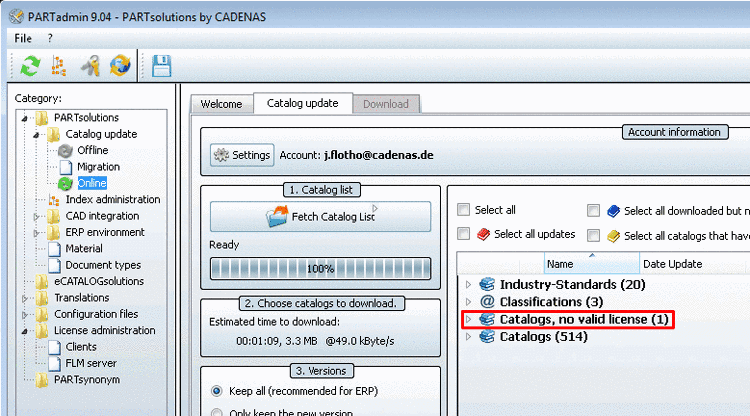 As of V9.03 catalogs without valid license are displayed in their own category under PARTadmin -> PARTsolutions -> Catalog update-> Online -> Catalogs, no valid license.